Ramiro and Martha Hernandez moved from Oregon to Washington, Iowa, to plant a new church among Hispanic people in eastern Iowa. They had successfully planted two Mennonite churches in Oregon, but planting a Hispanic Mennonite church in Iowa proved to be very difficult. After a few years of struggling to plant a church in Iowa City, Ramiro was invited to be interim pastor at the Templo Alabanza congregation in Moline, Illinois. He was also hired by Central Plains part-time as coordinator of Hispanic ministries. Martha was licensed for ministry and continued working to establish a congregation in Washington where they live. Together, Ramiro and Martha have introduced Instituto Bíblico Anabautista (IBA) to our conference. IBA is the Spanish language leadership training program of Mennonite Church USA. Ramiro facilitates IBA classes in Moline, and Martha facilitates classes in Washington and Iowa City. Martha estimates that over the past six years, over 140 people have participated in the life of the new congregation in Washington. However the group seldom numbered more than ten. Eventually, people would feel the need to move due to fears of detention and deportation. Now, Iglesia Menonita Centro Cristiano numbers about 30 including children. Six Central Plains churches have pledged financial support, making it possible for Martha to devote more time to ministry and evangelism. Martha says, "Ramiro and I want to be instruments in God’s hands available to do his work. Our goal is to evangelize and train new leadership to reach the Hispanic family with the gospel. We have waited for God to work and it has taken awhile for us to be able to see it. As we see these things happening, we continue to praise him." Shalom Mennonite Church is a member of the Central Plains Mennonite Conference of Mennonite Church USA. Committed to a common life of discipleship under the lordship of Jesus we meet to worship God and encourage one another in faithful living in a fallen world. Sharing the historical values of Anabaptist thought we seek to apply them in a manner that respects both the individuality of the person and the insight available from one another. We seek to be engaged with the world through practicing Kingdom values in the world. We seek to enact the Kingdom preached by Jesus in Eau Claire, Wisconsin through: Demonstrating our love of God by loving all people; Acting justly and living peaceable lives of nonviolence; Practicing reconciliation and demonstrating humility; Inviting others to join us in our life of discipleship. Shalom Mennonite Church is comprised of women and men from a variety of different backgrounds who share an identification with the Anabaptist tradition of faith and practice. Some of us were raised in Mennonite homes but others were raised in the Reformed, Catholic or Lutheran traditions. Some of us were raised with no religious tradition. Representing a wide span of generational, geographical, ethnic and experiential diversity, we seek to respect difference even within our shared unity. Open and honest discussion is valued, recognizing that we are called to support one another in our shared call to discipleship and not to "judge another man's servant." Respectful listening, honest sharing and in-depth discussion of the issues which impact how we live out our faith in the world is part of who we are. 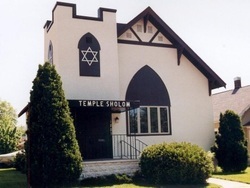 Shalom Mennonite Church was born in November 2006 as a daughter congregation of Emmanuel Mennonite Church in Minneapolis, MN. After many years of commuting to the Twin Cities for church, a number of families decided to plant a church in Eau Claire. After prayer and reflection it seemed good to the Holy Spirit and those families to undertake just that task. Shalom Mennonite and Emmanuel Mennonite continue to have a close relationship with members regularly driving to participate in the life of the other. 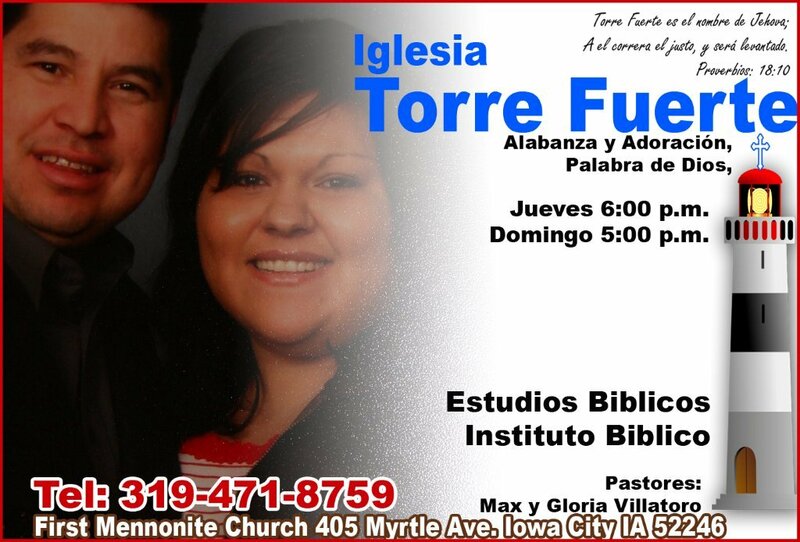 A church is developing in Iowa City out of the calling of Max and Gloria Villatoro. Having served as lay leaders in the Hispanic Mennonite church in Muscatine for nine years, the Iowa City couple was ready for a change. God had revealed to them that they would lead a ministry in Iowa City. In the meantime, Ramiro Hernandez began to encourage them to begin a Mennonite Church in Iowa City. They asked First Mennonite of Iowa City if they could use their building, and when the church said, “yes,” Villatoros knew they had what they needed to respond to God’s call. 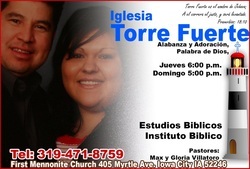 On May 5, 2010, they had the inaugural worship service to begin the church they named Torre Fuerte (Strong Tower). Many Hispanic and Anglo Mennonites from the area attended this first service to show support for the developing church. Max and Gloria’s vision for the church is that the church be a community that cares for its members. Max and Gloria have high expectations for the church. On the first Saturday of every month, Torre Fuerte will go door-to-door to invite people to church. Every Tuesday, four members of the church participate in IBA classes led by Martha Hernandez. Every Thursday at 6 p.m. is prayer meeting. Worship is held at 5 p.m. every Sunday evening at First Mennonite Church. The fellowship with First Mennonite has been critical to the viability of Torre Fuerte. “If we could not meet here for free, we could not survive,” Gloria says with conviction. But more than that, “They are like family to us,” says Gloria, who encourages her congregation to participate with First Mennonite whenever possible, especially for children’s ministries like Bible School and youth groups. Starting a new church is hard. For example, Max turned down a good-paying job because it would not have left him any time for church activities. Now, money is tight for the Villatoros, but they know they are following God’s will for their lives, and they are trusting God to provide for their needs.